Info "Only you can clear the ice in time!" InterMisson is a downloadable microgame in WarioWare: D.I.Y. and WarioWare: D.I.Y. Showcase. It was released in America on July 26, 2010. It is one of the six microgames and the sixth and final microgame made by Nintendo of America's Treehouse. The game starts off with a man in a machine that cleans the hockey field and the ice scratches. 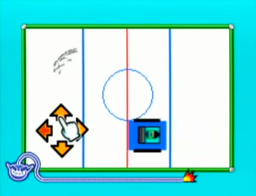 The objective of the game is to tap the arrow to direct him toward the ice. If the player doesn't clean the hockey field in time, the game automatically ends in a loss. This page was last edited on October 9, 2018, at 20:44.